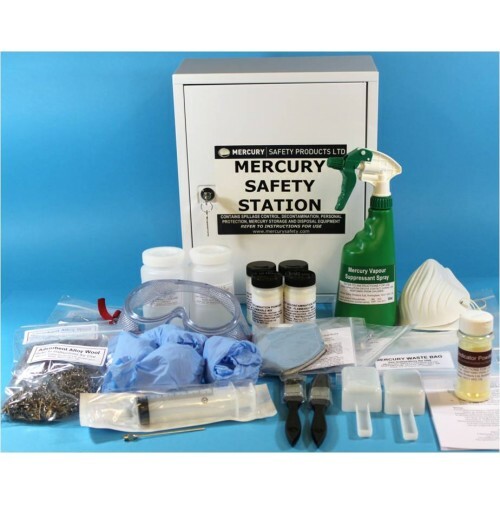 "EVERYTHING YOU COULD POSSIBLY NEED, ALL IN ONE PLACE"
Our flagship product; the Mercury Safety Station. Designed in response to our customers' needs for a single-location comprehensive mercury hazard management product which covers all of the event scenarios likely to occur in premises where mercury is used or is a known contaminant. 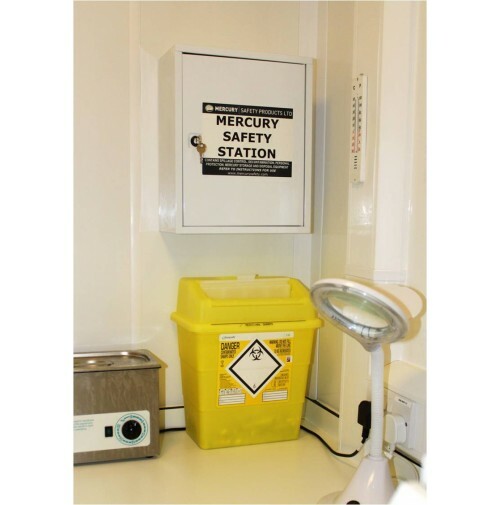 The Mercury Safety Station replaces standard mercury spillage kit deployment and is designed for installation in larger dental practices, petrochemical facilities, industrial laboratories, warehouse and distribution centres, and hospitals. 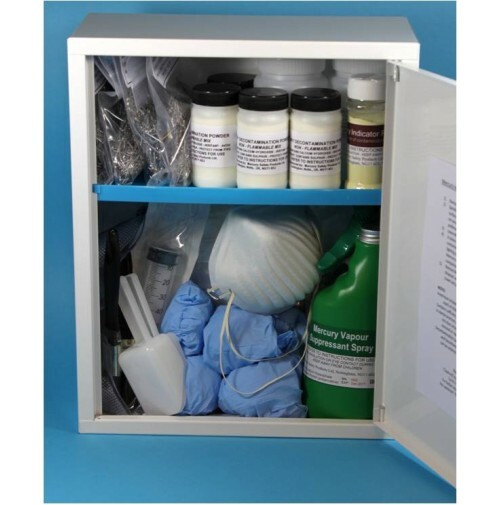 The Mercury Safety Station is housed in a strong, lockable steel cabinet intended for bench placement or wall hanging. It contains: safety goggles, 4 pairs of vinyl gloves, 2 dust masks, 2 mercury vapour-proof masks, aspirator syringe and stainless steel adaptor, 2 scoops and 2 brushes, 4x 100g alloy wool absorbent, 4x 75g decontamination powder, 500ml mercury vapour suppressant spray, mercury indicator powder, 2x 500ml HDPE waste bottles, 2 medium waste disposal bags, 2 large waste disposal bags, comprehensive instructions set out on 'event cards' to cover each scenario so that operators can respond effectively when the need arises. Spares and replacement itemas are available.